National Defense Authorization Act: Congressmen upset with lack of debate on new defense bill. 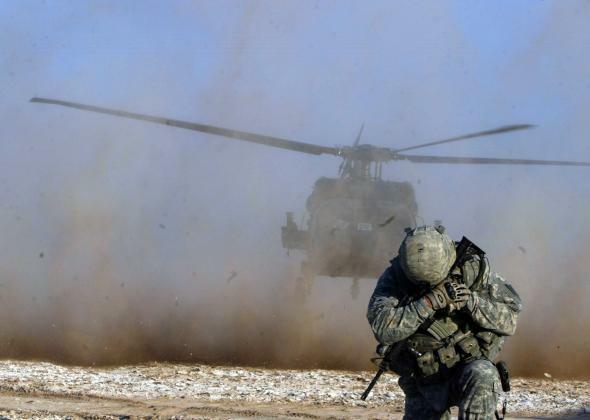 A soldier protects his face from helicopter dust during a joint raid by Iraqi and US forces in Kirkuk on December 24, 2010. Thursday afternoon, the House was set to pass legislation that would authorize two more years of support for the Syrian rebels, as well as continuing to authorize sending troops to Iraq. The legislation hasn’t drawn much controversy, and that has some anti-war members of the House frustrated. Rep. Beto O’Rourke (D-TX) said he was pushing colleagues to vote against the bill and that he thought there would be a chance to stop it. Rep. Pete Welch (D-VT) said the fact that the legislation was likely to pass with little controversy reflected poorly on rank-and-file House Democrats.